The Diocese of Como – which was established towards the end of the 4th century with the arrival of the first bishop, Felice – over time gained spiritual jurisdiction over the territory of the ancient Roman municipium, which extended toward the roads that lead to the Alpine passes (Lucomagno, Spluga, Maloja, Bernina, Stelvio). The diocese, therefore, included territories that corresponded with the entire current Province of Sondrio (Valchiavenna, Valtellina, Bormiese), a part of the Province of Como (the city and the suburban belt called "pieve di Zezio"; two pievi only to the south of the capital, Fino and Uggiate; the western shore of the Lario with the Valle Intelvi) and small areas in the current Province of Varese (Valcuvia and Valmarchirolo) and Lecco (pieve of Mandello). 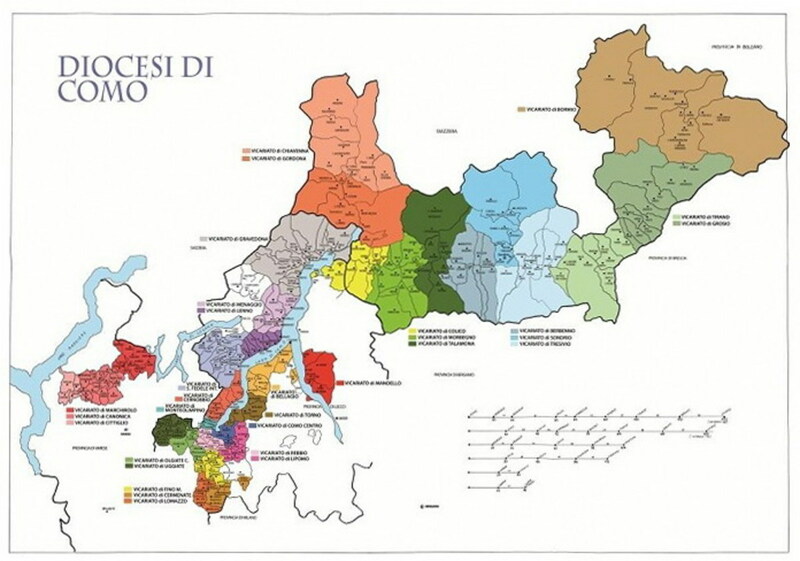 The bishop of Como, up until 1885, also had jurisdiction over the larger part of the current Ticino Canton (pievi of Balerna, Mendrisio, Riva San Vitale, Lugano, Agno, Locarno, and Bellinona), excluding three valleys – Blenio, Leventina, and Riviera, which formed the pieve of Biasca – and other individual locations (Brissago, Tesserete) united with the Diocese of Milan. The pievi of the Ticino Canton were assigned to the Papal Administration of Ticino, then the Diocese of Lugano. Similarly, in 1871, Poschiavo Valley (currently Grigioni Canton) passed under the authority of the bishop of Coira, which previously belonged to the Bishop of Como. The presence of portions of the territory belonging to Milanese jurisdiction including or variously interposed to the Como portions came from the overlapping of competing political-economic interests of the two cities on the communication routes with the North.